How did a 0.1% investment help create repeat business for my ecommerce store? In the early days of ecommerce I owned a guitar shop. Our niche was premium end guitars. Where players would comfortably spend £1000 or more for the right sound, brand and style. With our website, we did what we could to build customer confidence. Imagery. Honest descriptions. Ease of use. It still surprised me how many sales came through from new customers with no pre-sales communications (this was in the days before chatbots). High ticket items, where the customer discovered the guitar they wanted, considered and purchased. Guitar buying can be an addiction. GAS (Guitar Acquisition Syndrome) troubles many a player. For customers to return, I needed to make sure they were looked after. That they felt looked after. Retention was a vital element of our growth strategy. We did something very simple and very effective to warm our customers to our retail brand. We spent £1 on them. That one pound probably drove 75% of the customer reviews we received and considerable repeat business. Each guitar that left our warehouse was setup to perfection. New strings, polished, tuned, making the guitar look and sound perfect when the case was first opened and the guitar was first played. Tucked into the case was an envelope with a short note explaining to the customer the strings we used and why. I also added a selection of guitar picks dependent upon the guitar purchased. Heavier playing, heavier picks. As we knew our customers and our products well, we could make a comfortable prediction about the style of guitar played and the products they’d probably need. Those few picks fuelled customer response. Each day I received emails from customers delivering their feedback. Sure they talked about their love for the new instrument. However, the simple note and the gift are what inspired customers to feedback. They said ‘thank you’. There’s nothing more that you, as a retailer, can ask for then a ‘thank you’ from your customer. Those picks cost us pennies. Those reviews earned us trust. It wasn’t a stunt engineered to drive customer retention. It was just a simple way of showing our customers we’d thought ahead about what they needed as they played those first chords on their new instrument. We became part of that moment. So, before you begin throwing discount codes at your customers as a tactic for retention, consider what you could do to be part of that moment where your customer receives their product from you. The unboxing. The first use. It’s how you shift from being a product retailer, a service provider, to a trusted partner in their own pursuits. It’s the simple stuff that can have the greatest impact. It’s the simple stuff we, as marketers and retailers, often skip. We built long standing relationships with those customers. They rarely reached out pre-first purchase. We made damned sure they did when they considered their next. Helping you advance the customer retention strategies that drive profitable ecommerce growth. Consultant, Writer & Conference Speaker. Is this our secret or shall we pass it on? 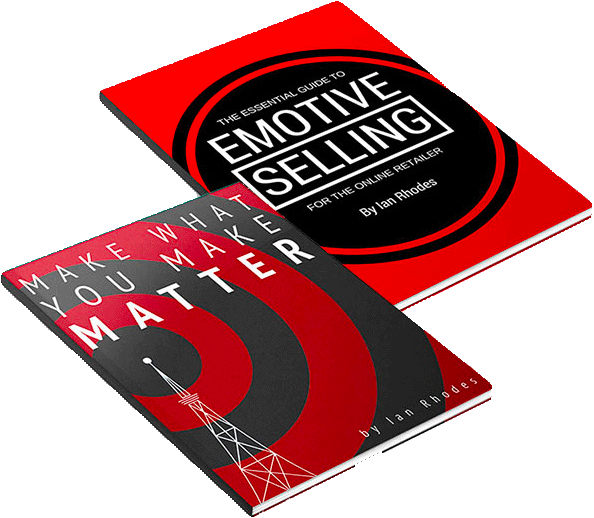 + get started now with free copies of my 2 latest ebooks. You in?